Achieve operational flexibility and reliability by using a containerized version of WURFL for your operations to detect devices. Key Point Device detection solutions allow customers to simplify deployment and maintenance through containerization while achieving accuracy and performance for which WURFL is known. Achieve operational flexibility and reliability by using a Dockerized version of WURFL for your device detection operations. Users can simplify deployment and maintenance while achieving the accuracy and performance for which WURFL is known. Whether used for mobile optimization, advertising, or analytics use cases, WURFL Microservice for Docker device detection provides an enterprise’s devops team a reliable container that they can integrate into their larger architecture. 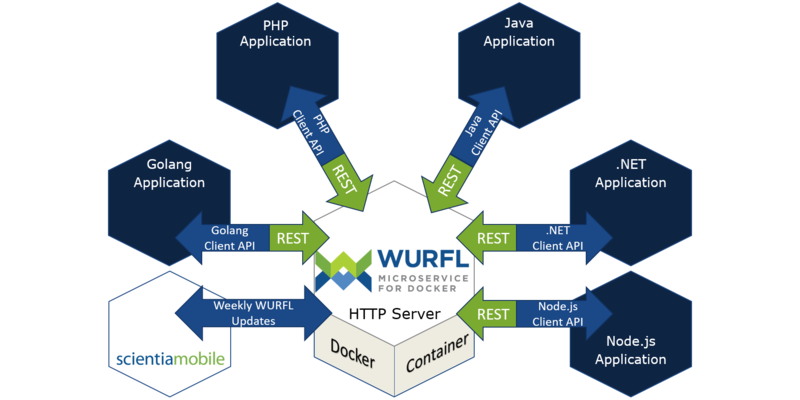 After installing WURFL Microservice, developers can integrate client API libraries for Java, PHP, .NET (C#), Node.js, or Golang. The client API supplies the HTTP request (and more specifically the user agent) to the the microservice and returns the results of the WURFL device capabilities. Developers can quickly integrate WURFL into their larger microservice application architecture. The client API leverages its local cache to provide high performance from the overall WURFL Microservice architecture. ScientiaMobile offers a wide selection of WURFL capabilities from which commercially-licensed users can choose. These include virtual capabilities that combine the logic of several core capabilities. For example, “form_factor” will identify the device as “desktop”, “smartphone”, “tablet”, or several other classifications of devices. This saves developers effort needed to create their own logic to address common business questions. Developers can use these capabilities to provide more fine-grained optimization, control, and to detect device analytics. WURFL Microservice for Docker achieves over 99% accuracy by searching the internet and being able to detect devices for over two billion user agents per month. ScientiaMobile quickly identifies new devices, including long-tail Indian and Chinese devices, and delivers high-quality device intelligence updates to commercial customers every week. For even greater accuracy in identifying specific iPhone and iPad models, customers can add-on ScientiaMobile’s WURFL.js Business Edition. WURFL Microservice for Docker’s XML Updater can automatically check for a new device data XML snapshot from the customer vault, download, and reload the engine. It can do this with no interruptions to serving requests. With this automatic updating, WURFL Microservice for Docker is an always-updated solution, with high accuracy, and a minimal maintenance. Many internet leaders like Google and Facebook use WURFL in their global, high-volume detection operations. Over 15 years, ScientiaMobile has developed an efficient data structure and well-tuned API search algorithms, delivering high-performance device detection that never sacrifices quality and accuracy. Commercial licenses are available for single site, multiple site, and OEM device solutions packages. WURFL Microservice for Docker was a big win for our DevOps team. Now, we can rapidly deploy new images and drive ads using accurate mobile device subsystems from several hubs around the world.